This year, a little piece of Biscayne cruised up San Diego Bay and into the halls of Comic Con. It’s been 30 years since Miami Vice debuted in September 1984 and, though its influence never left pop culture, the television series is in the midst of a well-deserved resurgence via streaming services. 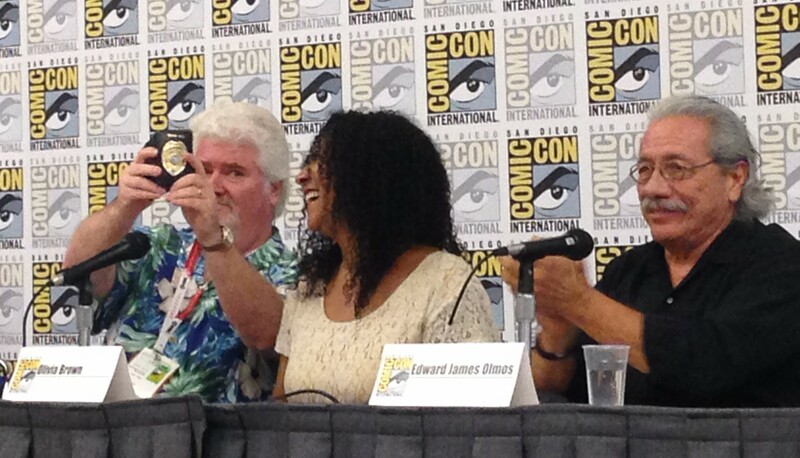 Crockett and Tubbs didn’t make the Comic Con scene, but the heart of the show was well-represented by beloved cast members Michael Talbott (Stan Switek), Olivia Brown (Trudy Joplin), and Edward James Olmos (Lt. Martin Castillo). The cast, joined by the creative team behind Lion Forge’s Miami Vice comic, shared stories from their time working the mean streets of South Beach and amazing behind the scenes anecdotes. For Talbott and Brown, they were filming the first season in blissful ignorance of the cultural zeitgeist they were in the midst of. Only in their first break from filming did they get a notion of how big Miami Vice had become. Meanwhile, Olmos, who came into the series after the early departure of the show’s first Lieutenant, was well aware, but initially passed on the offer to be in the show – four times in one night. The story, as Olmos related it, was that series Executive Producer Michael Mann called him up out of the blue. He didn’t know Mann personally, but knew his work, and was stunned when Mann offered him a role paying “more money than my father made in his entire life.” The catch was that the series required exclusivity and Olmos had plans – he needed the flexibility to work on additional projects; namely his film Stand and Deliver. Mann beseeched him saying, “I need your help.” The shooting for the first episode with the new character was to start the next day. Olmos, though low on funds and with two kids, declined and hung up. He did this two more times in the same night, refusing more money each time and even his child’s tears – as his wife put it, “he doesn’t understand why his father doesn’t want to work.” On the fourth call, Mann gave Olmos everything – massive pay, flexible availability, and the ability to craft his character from scratch as he often did with his roles, such as Gaff in Blade Runner. Thus the Cuban Bushido warrior cop Martin Castillo was born. While that story is remarkable in its own right, it doesn’t have anything on the initiation that Talbott and Brown went through. Along with the rest of the Vice Squad, they were taken to police academy and didn’t just learn accurate gun skills – they went into the field. Talbott found himself working on drug busts and pulling up pot trees in a rasta house, while Brown and her co-star Saundra Santiago (Gina Calabrese) actually walked the streets as hookers. Not practicing of course, but luring Johns into legit police stings. Wardrobe supplied the actresses with posh, Madonna-style outfits while the rest of Miami’s real world working girls were in shorts and rollers. According to Brown she and Santiago were very popular with the clientele. The panel was moderated by Miami Vice comic author Jonathan London and featured series editor Shannon Denton. London’s series is a Vice fan’s dream – taking the loose continuity of the show and filling in the blanks with new stories that feel like they stepped right out of the screen. Denton’s dedication was proved in aching muscles as he frantically biked home after playing in high school football games to catch the latest episode when the show originally aired on Friday nights. 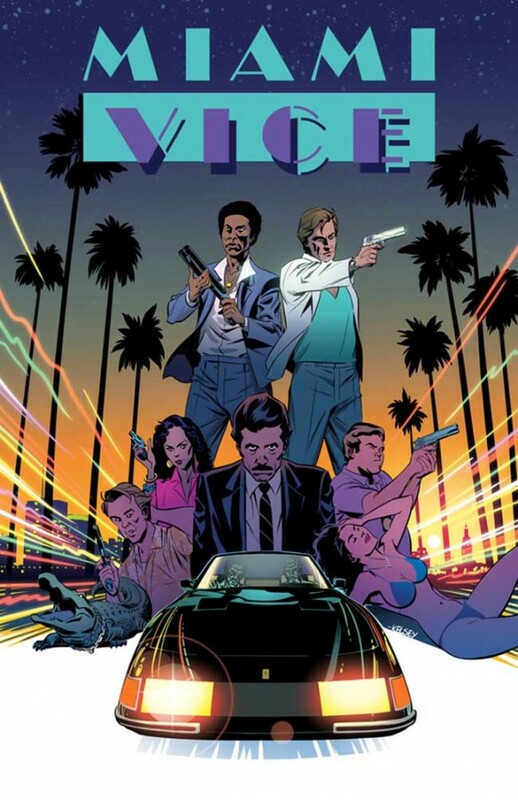 The NBC representatives, the Lion Forge team – Everyone involved in the current proliferation of the series grew up loving Miami Vice. That fan passion was matched by the cast, who’s familial camaraderie was genuine and fueled a wealth of stories and fun facts. For example; Phil Collins appeared on the show in the classic episode “Phil the Shill”, not only because the musician’s work was often featured on the show, but he was also an actor and wanted to guest star. But there were other well-known personalities straddling the musician/ actor line who approached the show and were turned down. Both Bob Geldof and Sammy Davis Jr. were told they “weren’t right” for the show. Though Olmos had profound control of his character’s portrayal from the get-go. The rest of the cast had substantial influence over their characters and contributed to other creative elements from time to time. Talbott, who still caries his Vice badge and still wears his character’s wrist watch which he stole off the set, was responsible for the use of Godley and Creme’s “Cry” at the end of the season 2 episode “Definitely Miami”. As Talbott tells the story, he woke up one morning to the news of the Challenger space shuttle disaster and while watching MTV saw Godley and Creme’s video. With the melancholy mood cast by the shuttle’s destruction, he was immediately captivated by the song and called up the LA offices encouraging them to get the track on the show. Good thing he did too, “Cry”‘s inclusion is a perfect Vice moment. Though it should be noted, the dates of Talbott’s story don’t match up – Challenger exploded 18 days after “Definitely Miami” aired. But hey, the only ones who’ve gotta keep their stories straight are the criminals. When it comes to the iconic look and feel of the show, Michael Mann often gets all the props. 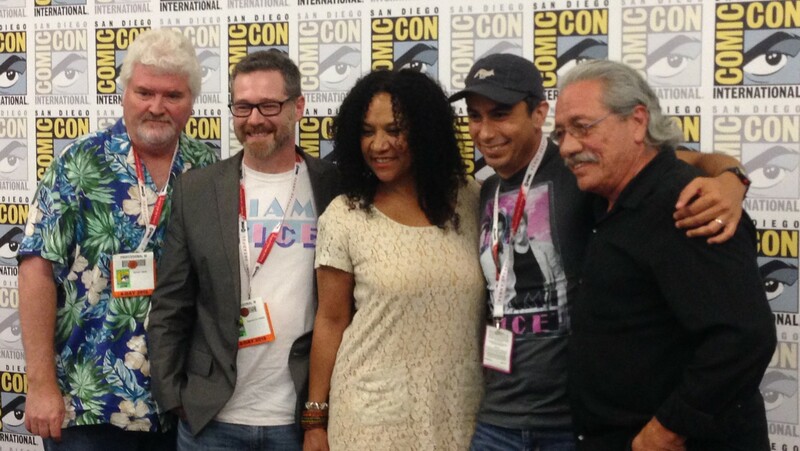 But Olmos took special note to give due credit to Thomas Carter, the director of Miami Vice‘s pilot, for setting the tone for the entire series. Olmos says Carter’s style existed outside of Mann’s. In fact, according to Olmos, Mann was seldom around unless someone had gotten on his bad side and there was yelling to be done. The stories could’ve easily kept going long after the panel ended, and they might yet have a chance to be told: Brown says she’s working on a book chronicling her experiences on the show. In the meantime, Miami Vice and its unforgettable characters live on in Jonathan London’s awesome series (it’s getting collected in a physical edition next year, but you can read all 8 issues now on Amazon or and Lion Forge’s site) as well as in the complete reimagining of Vice from Joe Casey and Jim Mahfood: Miami Vice: Remix. But what are the characters of Castillo, Trudy, and Switek up to in 2015? Until there’s a relaunch of Vice to tell us otherwise, Olmos, Brown, and Talbott gave us their two cents: Castillo is retired, Trudy is training future vice cops on how to walk the streets, and Switek is mayor of Coconut Grove, but also an undercover mall Santa on holidays.